Finding properties of unknown material with known and/or partially known designation is a very common engineering activity. Although sometimes fairly trivial, this task can often be extremely tedious and time-consuming, especially when materials originate from different countries and standards are involved. Suppose that you want to identify material with the designation 1.4301. Origin of the material is unknown. Your first step is to choose a search option. 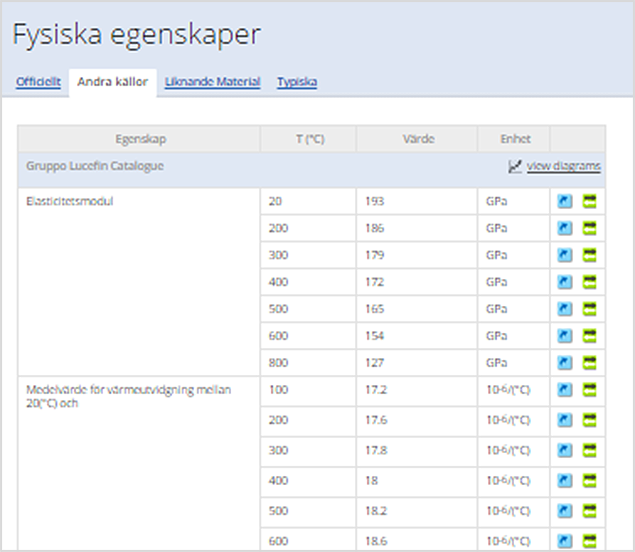 Total Materia search engine performes searching material(s) by designation most efficiently through the Quick Search option. Enter material 1.4301 in the designation field. Spaces and cases are not relevant for searching, since the world standards of steel designations are not treating spaces in a uniform way. Since the origin of the material is unknown, leave All in country's pop-up list. 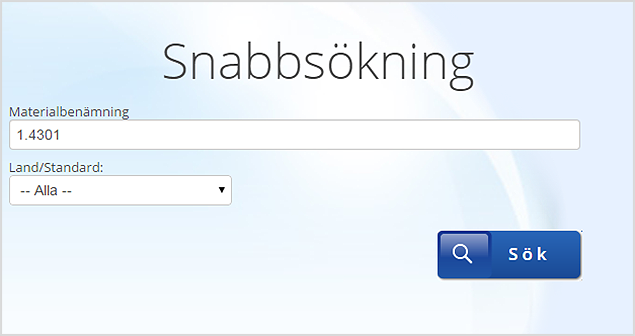 The search engine will search the whole database. All you have to do then is to simply click on the "Search" button. 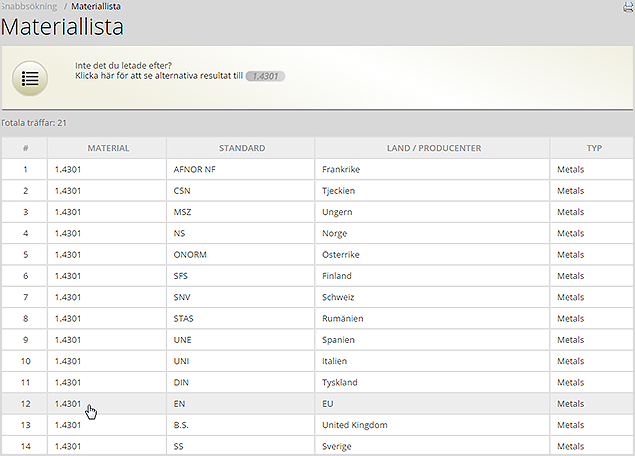 In a few seconds Total Materia search engine will find all materials in the world, which have 1.4301 in their designation! Searching materials by designation generally results in a list of materials that satisfy the criteria you gave. 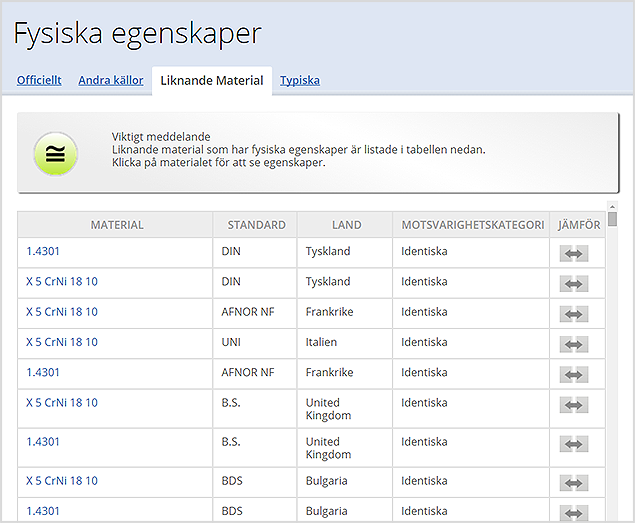 Depending on the search criteria, this list can be quite large (up to 2000 materials), but in our example the resulting list consists of 21 materials. 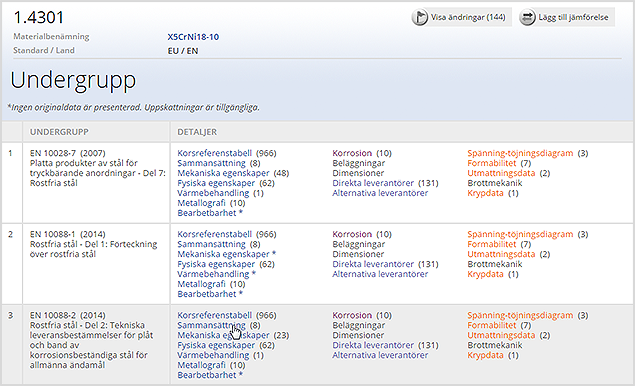 By clicking on their designation, you can retrieve and review their properties. Suppose that you are mainly interested in German steel materials, defined by EN. Therefore, select steel defined by EN from the list. Sometimes materials with the same designation can be defined by various standards in the same country and/or belong to more than one group and subgroup. Although chemical composition usually does not vary significantly, group/subgroup where material belongs sometimes has significant consequences on mechanical properties of the material and its application. 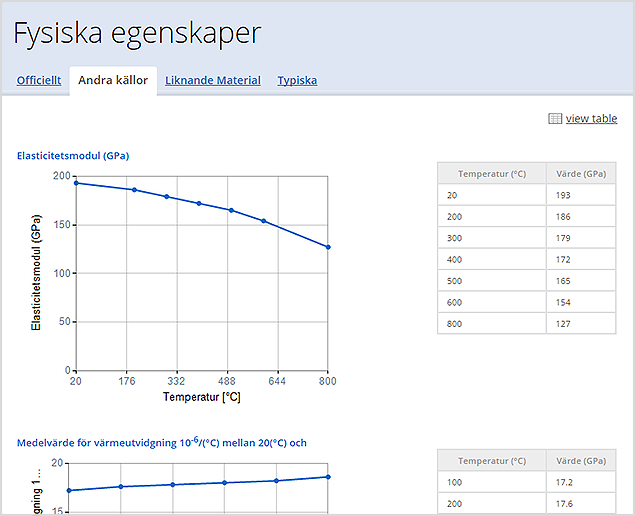 Now all the parameters are defined, you can view properties of the materials. Everything is completed in less than one minute! Total Materia displays chemical composition, mechanical properties of the material,cross-reference table (i.e. table of similar steel materials) and much more. You can view those properties by simply clicking on the related link. 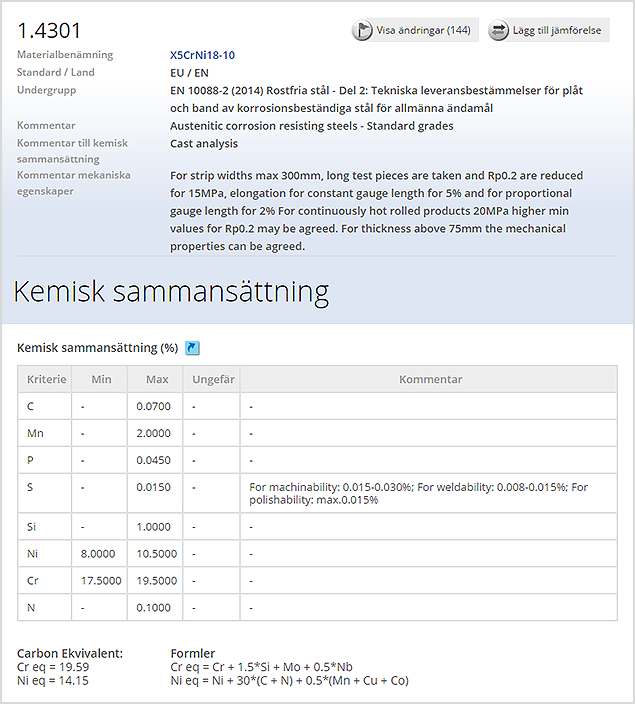 By clicking on the composition link you can view the chemical composition of the selected material and information on the Carbon Equivalent along with comments relating to the delivery condition of the material. Mechanical properties are presented according to each condition of the material that the user can define by using the condition selector. It is also possible to use the radio button to view data for all conditions.The default tab shows all available data at room temperature. 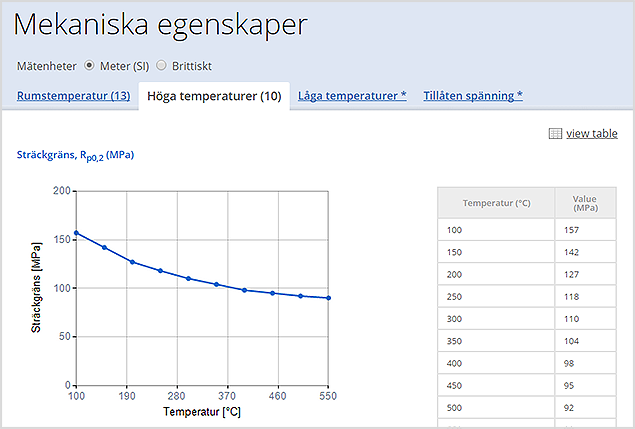 In the other tabs it is possible to find mechanical properties at high and low temperature with the possibility to view the data in the form of a temperature dependency diagram by using the radio button. Other sources information comes from other recognized and trusted sources like official handbooks to further compliment the available data. Each other source is accompanied by its own reference to ensure traceability. Again, it is also possible to view data in diagram form if preferred. Total Materia harnesses its cross referencing capabilities by also providing a list of similar materials which also have direct physical properties available for them. 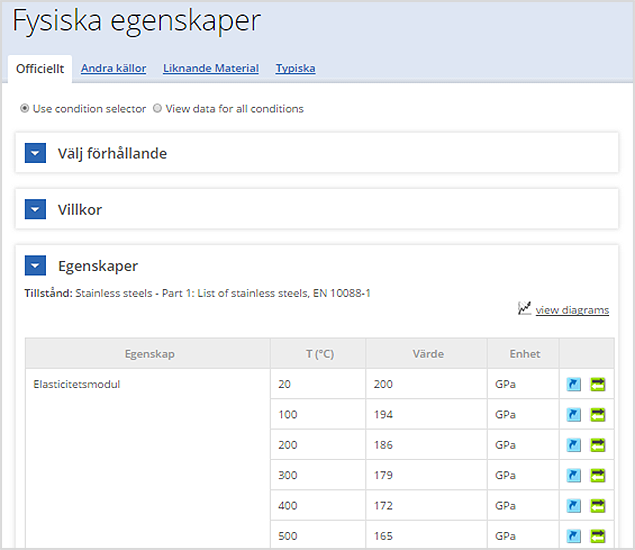 This opens up even more new possibilities for finding useful property data in Total Metals. 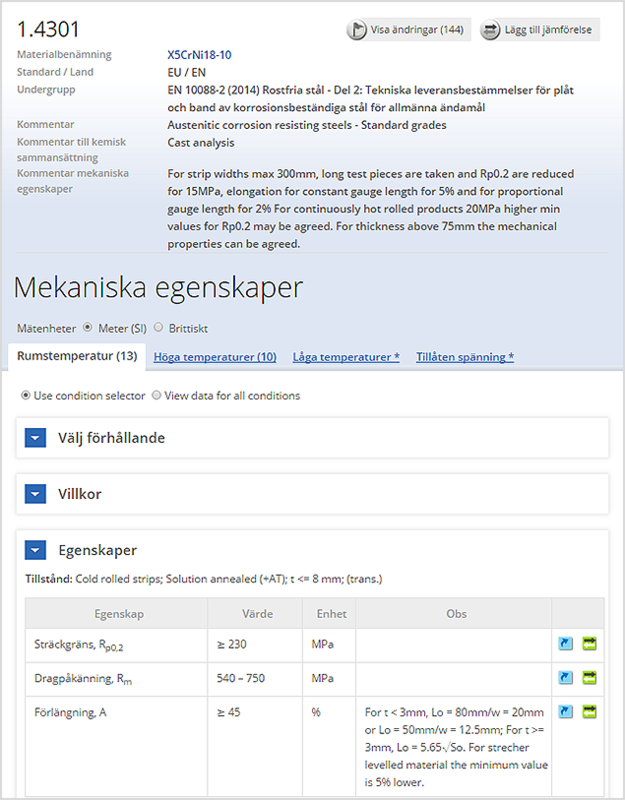 Other data available in the Total Metals module includes machinability data, heat treatment guidelines and diagrams, metallography images and corrosion data. See our other guided tours for more detailed information.